On the Wednesday, April 10 episode of WGN America’s GONE, the team investigates a couple who has gone missing during a camping trip in the mountains—after an alarming 911 call. In an exclusive clip from the hour, “Don’t Go,” Kennedy (Tracie Thoms) and Finley (Andy Mientus) fill the group in on the case—but Frank (Chris Noth) warns there is the possibility the couple’s disappearance may be tied into another disappearance. 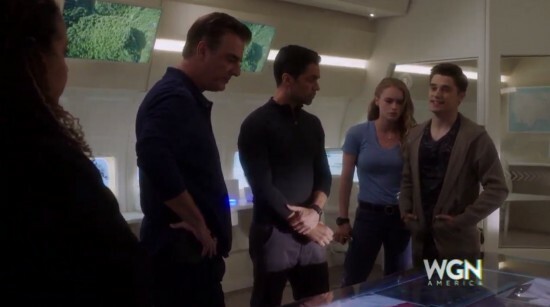 To get a better read on the situation, Frank decides to send Kick (Leven Rambin) and Bishop (Danny Pino) to the crime scene to meet a search dog and its handler. “That seems like a pretty big area for just three people to cover, right?” Kick asks in the video below. “More people on the ground will only confuse the dog and alert the kidnapper,” Bishop points out.